Are you on a mission to enhance your guest reception area? It all starts with the front desk! It serves as the focal point of your space. Today we'll provide you with everything you need to know to select an awesome reception station for your business. From the best brands to the hottest new finish options, we've got you covered. Mayline: With more than 10 popular lines available, you'll be at no shortage of modern and traditional reception stations to shop from Mayline. Their furniture is well respected and reviewed in the design community. Global Total Office: Global's array of modular components makes it easy to craft elite guest reception areas. With the versatile custom furniture from Global you'll be able to create single and multi user reception desks that work perfectly in you welcoming area. OFM: While competing brands are looking for ways to imitate the latest trends, OFM is hard at work setting new ones in motion. They're curved front reception desks are incredibly cool and modern. They look great from every angle! Once you've settled on a brand, you can focus on your favorite collection. There's plenty of options out there, but a select few are really turning heads in 2017. We've provided a list of our most popular reception desk collections below. Medina: It's the hottest line on the market. The trend setting Medina reception desks from Mayline feature glass accented transaction counters. They're available in rectangular and L shaped variations. Medina reception desks are guaranteed to earn your space an abundance of positive compliments from valued visitors. Zira: Talk about options! With Zira, you're only limited by your own imagination. Zira reception layouts take approximately 4 weeks to manufacture, but they're well worth the wait. If the average desk just won't cut it, turn to this incredibly versatile line. Marque: The Marque reception desk collection from OFM is a favorite of interior design teams and industry professionals alike. As an added bonus, these curved front guest reception stations actually require no tools for assembly. No that's user friendly! Now let's break down the top reception desks available in 2017! Medina MNRSLBF: This L shaped reception desk is an absolute winner. The MNRSLBF features an L shaped design that's complimented by silver accents and a glass transaction counter. 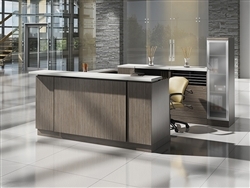 Zira-Reception-13: This Custom U shaped reception desk offers no shortage of wow factor. With it's glass accented wardrobe cabinet and array of storage compartments, you'll be hard pressed to find a more well rounded and unique option on the market for your project. Marque 55293: This curved reception desk is ready, willing, and able to make an impression on your guests the minute they walk in the door. The 55293 Marque triple reception station from OFM is accented with silver metal trim. The curved operating surface makes for improved and efficient operating. You don't have to break the bank to create a cool new guest reception area. Quality stations are available on the market for under a thousand bucks from brands like Offices To Go and Cherryman Industries. 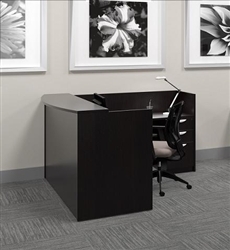 For example, the Offices To Go SL-O reception desk is an absolute bargain buy at $620.99. High end models like those from the Zira collection above are going to be upwards of $4000.00, but they're completely customizable and intended for truly elite projects. The average reception desk purchased in 2016 was about $1500.00. Variations from the Medina and Marque collections are definitely available in this range. The reception desk finish you select will say a lot about your space. If you're looking to keep things traditional, consider classic tones like cherry, maple, and mahogany. That said, the modern revolution is in full swing. 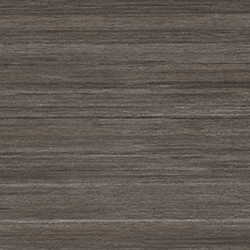 This year cutting edge finishes like Mocha, Absolute Acajou, and White have become incredibly popular. If you're looking to set your space apart from the competition consider a unique finish that will wow your guests. With grays and whites you'll create a modern coastal vibe with high end flair. Dark woods offer a luxurious feel and they also show minimal wear over time. As a rule, you'll definitely want to order a variety of finish samples from your dealer of choice before making a purchase.